Joe Blogs: Have I dugg deep enough? 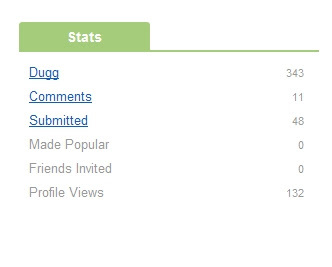 Below is a screenshot of my progress on Digg so far and it doesn't make for good reading on the popularity front. That's not the reason I am involved but it's there and making a story popular would mean that my stories being submitted were at least interesting to others. I have managed to get a few friends together from the site and also a few fans along the way as well. Are the friends/fans just using me for leverage to spread word of their stories though I don't know?! Checking out other people's profiles and they have this nailed with stories they submit becoming Popular and constantly being in the mix. I think the key is being a reader for a while and building up your 'fan base'. It's very much like organised spam but it's more than that as it's addictive, distributes stories and it has a decent community. I feel I have an addictive personality so you guessed it I am hooked at the moment and will continue digging until I fall out of the bottom ha!